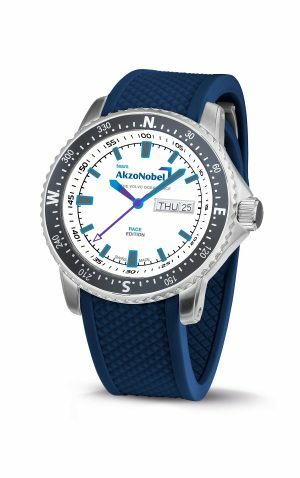 As a passionate Dutch brand for nautical time pieces, TNG Swiss Watches is more than excited to be the Official Timing Partner for team AkzoNobel in the Volvo Ocean Race – one of the longest and toughest professional sporting events in the world and a 45,000-nautical mile (83,000-kilometer) ocean racing marathon. The team has finished on the podium in six out of 11 legs during the eight-month race around the world and finished fourth in the overall ranking. The crew also set a new outright 24-hour distance time for the Volvo Ocean Race on Leg 9 from the United States to the United Kingdom when they clocked up 602.51 nautical miles (1,115.8 kilometers), making them the fastest Volvo Ocean Race crew ever in the 45-year history of the race. To commemorate the Dutch Campaign, TNG has designed an official team AkzoNobel Limited Edition Watch Collection. The collection contains three models; team Sports Gents, team Sports Lady and team Sailing Gents. 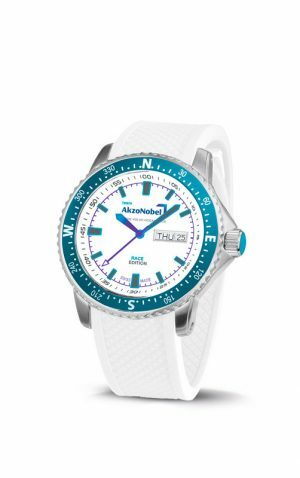 All models are Dutch designed, Swiss made nautical sports watches, decorated with the official colours and symbols of team AkzoNobel in the Volvo Ocean Race and an embossed/engraved team AkzoNobel logo on the case-back. The models are available to order online, untill all Limited Edition copies run out, so order yours now!